Romania is an old country, once occupied by a communist state and now suffering from the imposed austerity measures that are a fallout from the global, and continuing European, economic crisis. This is a feature that the people have to live under. It was brought home immediately by my driver who is an ex-police officer who now has to work because his pension has been cut and so must support himself again. That seems to be only a shadow that this warm and friendly people have to live with. All of the Romanians I met while in Cluj were friendly and seemed a little more relaxed than their more Western European counterparts. Perhaps it is the glorious sunshine that blessed my entire stay, or the feeling that this is a country once shackled by oppression, fighting the changing shape of democratic structures and some inherent corruption that comes with that, but yet hopeful of building strong communal societies. They like to support family and are very progressive in their social organisation. So the current austerity bites hard, but it seems that the people of Cluj live through this with a regret that doesn't mar their relaxed natures. 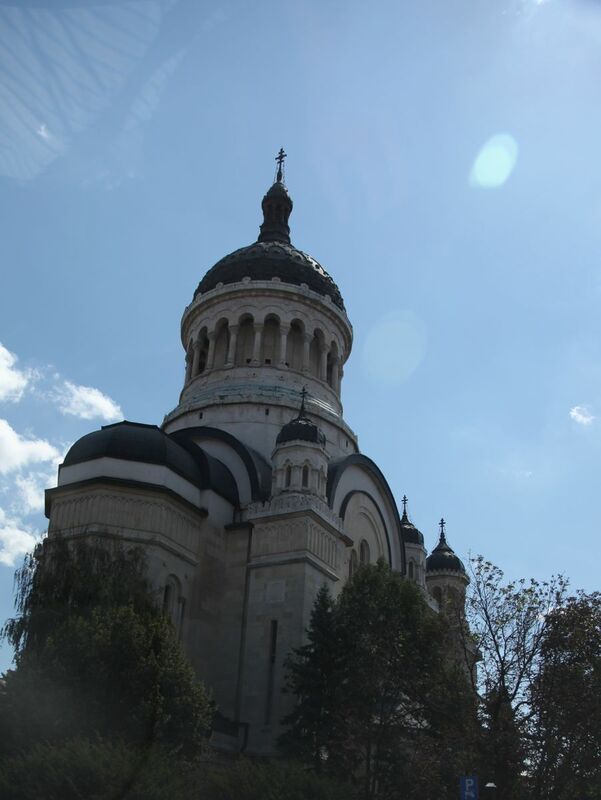 Cluj itself, or rather Napoca, is a city that existed long before the invasion by the Roman empire and there are traces of history throughout the area. Cluj has some small Roman artefacts but has a larger number of walls and structures left from years of occupation and conflict with the Eastern empires of the middle ages. Because Cluj sits in Transylvania there is the obvious link to Vlad Teppes, or as the cheap souveniers would have it Vlad Dracul(a). Happily I have a little more knowledge of the history of Teppes so would not be so insulting as to immediately make that link with a man who is a national hero who freed the people of Romania from the occupying forces of the Turkish Empire. 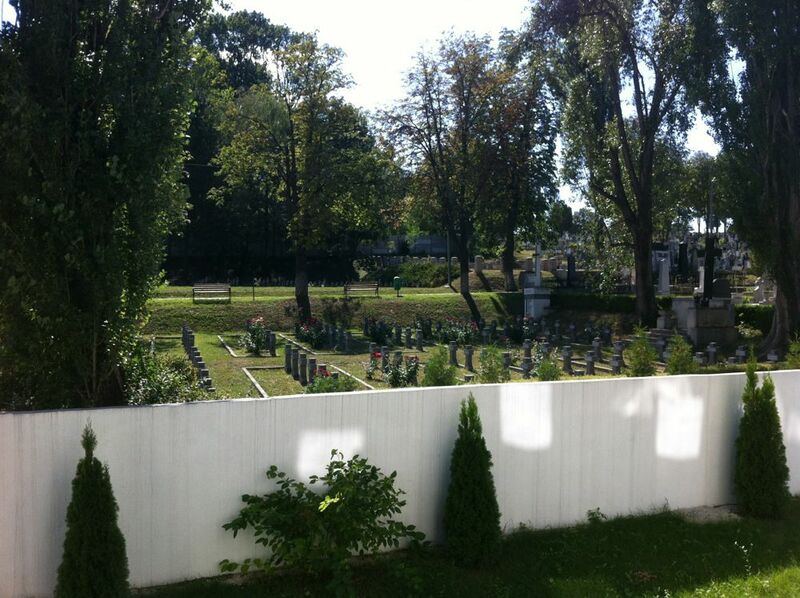 It was, however, amusing that my hotel looked out over a graveyard and the local wine served there was a 'blood' red called Vlad Dracula Merlot. If only it had been cooler in the evenings I might have got early morning pictures of a misty graveyard to fully realise that Gothic atmosphere. Instead I was graced with gentle rays of sunlight that made the trees and stones sparkle in the early day. I should also note that most things in Cluj are cheap by Western European standards, the average beer is around £1.20 or €1.50 to £2 or €2.50, food is not that much more for a single course, so you can easily have a beer and a meal for around £5 or €7. Transport to Cluj usually means changing at locations such as Munich and catching a smaller flight, but this isn't too great a hindrance. The Evozon office, which sat very close to the hotel they placed me in, is a nice modern building. Evozon itself has already outgrown this and have floors in two other buildings nearby. The office has several floors and includes a recreational area, an outside seating area, and a small room they are building into a hardware hack space, which is interesting as we are hoping to do something similar at Shadowcat. It looks and feels like a great place to work. The people who work at Evozon, from the receptionists, developers, managers, wonderful HR staff and senior management are all great people. They made me feel instantly welcome and relaxed, all my needs were taken care of and addressed by anyone I spoke to. I have a particular need to thank all of them for making me so relaxed and happy to be with them. They also have good coffee available as filter and espresso. There are some people I have to make special note of. I want to thank Robert and Gabi for taking the time to make me feel welcome and ensuring I looked after for despite the fact that they were very busy guys. 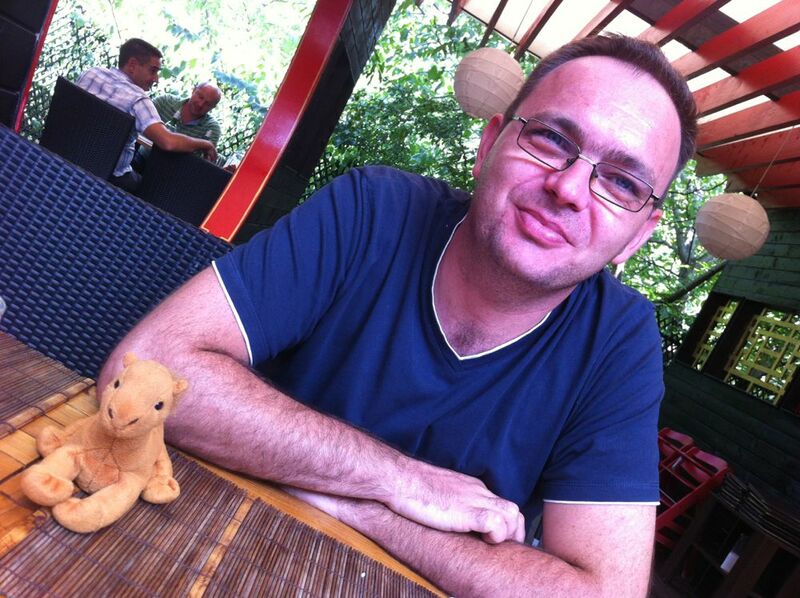 I want to single out Mircea Patachi for being my guide to the staff and for making sure I was kept in good company (his) in the evenings and daytime for meals and entertainment, so for taking the time to spend with me despite being a very busy guy, so I wouldn't feel alone. 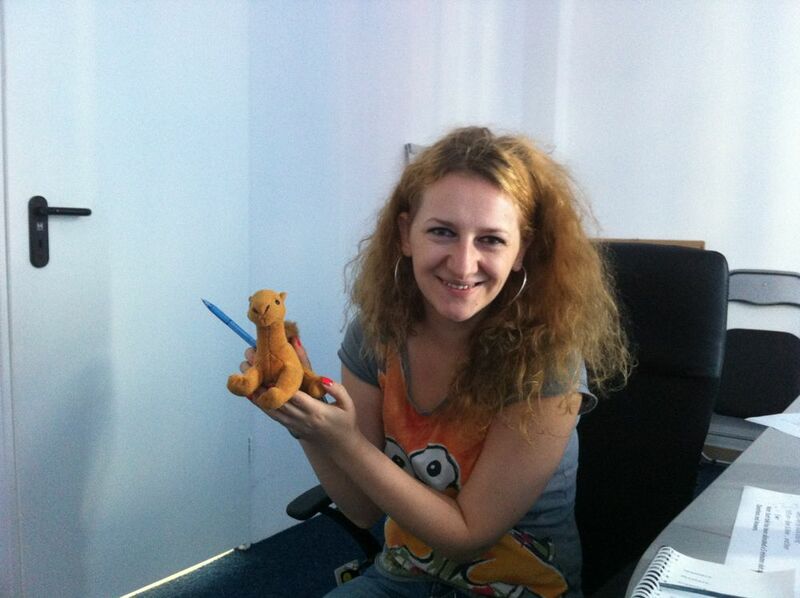 A very special thanks has to be made to Amalia (Aida) Pomian and the rest of the HR team. Amalia organised all of my stay and organised the event. She took great care of everything I would need to do and went out of her way to make sure I was happy. She took all of the stress away and her efforts are what made the evening mini-conference such a great event. Evozon, like Shadowcat, sees the importance of a relationship between business and community. They are keen to not only promote their company but to build a strong local community in which they, and other software companies, can thrive. There is no metric for measuring the return you get from investing in a community. There are several factors that you can see as a return or a benefit. But their qualitative impact is not a thing you can quantify. So it is always helpful (in fact awesome) when the chief operational officers understand that and still want to build the community. Evozon are keen to have a strong workforce with talented staff, but they are also keen for the languages they use to succeed. They like to invest in Perl and the Perl community to help this happen. 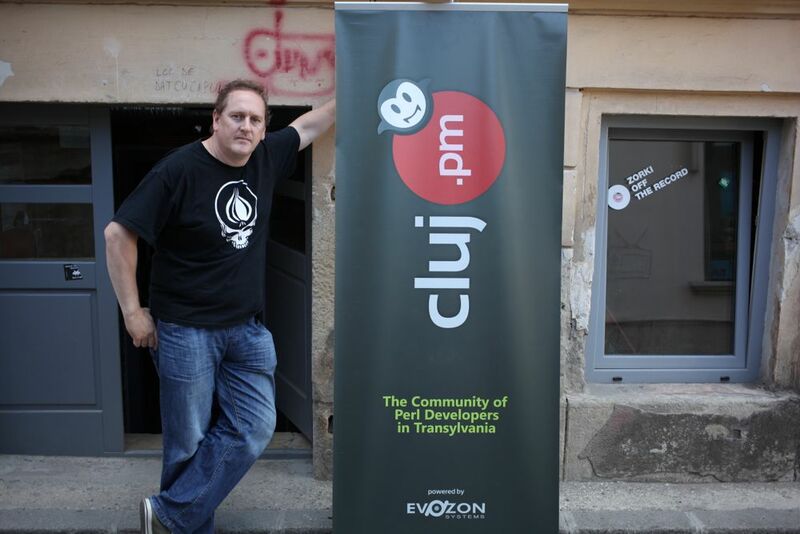 The developers at Evozon, like developers everywhere, and the people of Cluj seem to enjoy their ales and wines. It was wonderful to sit outside in the failing light of the market square and share some hops with the locals. I also had the pleasure of intelligent, and sometimes circumlocutory, debate with the people of Evozon. We discussed the future of connected devices, biological systems and all manner of things in between. It was particularly interesting to hear about the political history of Transylvania from Tudor Constantin. 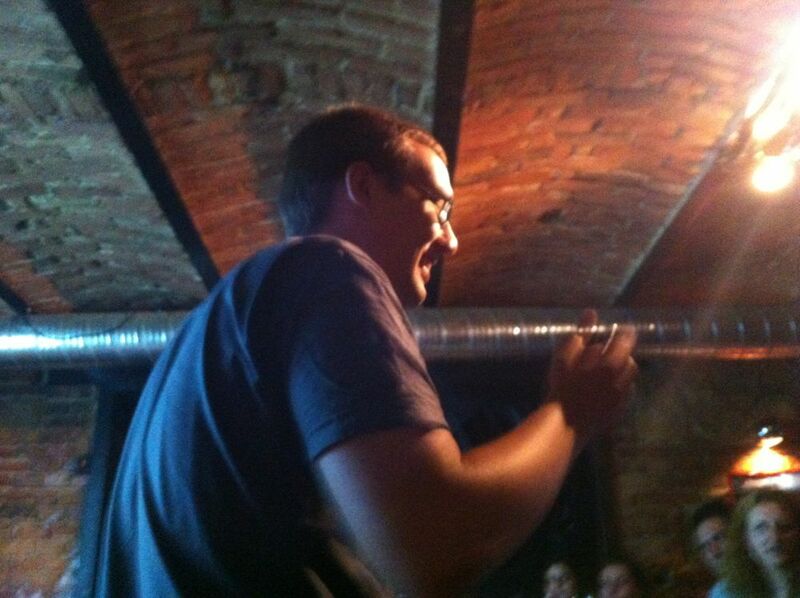 The good people of Evozon also took me to an underground club, a seemingly comon feature in Cluj. 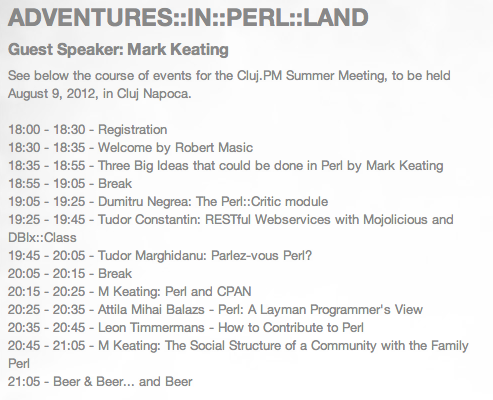 Cluj.pm has, in my opinion, the coolest logo of any Perl Mongers group, it is a thing of great funkyness. I would be jealous, except they also have stickers of the logo and so I was able to get some of them for myself. Eventhough, as I mentioned, there is more respect for Teppes there is a natural need to use the iconography of the literary connection. So the people of Evozon work-shopped the idea for the logo and they got their designer to concoct it. The designer was called Vlad, I am not making this up, like Tudor it is a common name in Romania. Vlad the Designer did a vampire logo, a part of me went 'squee' when they told me his name. The evening meeting, though dominated by Evozon who provided all the organisation and employ a large number of developers, had a number of non-Evozon people who turned up for the event. I was informed that a larger number of non-Evozon people turned up than previously which was good to hear and hopefully a good indicator for their community. 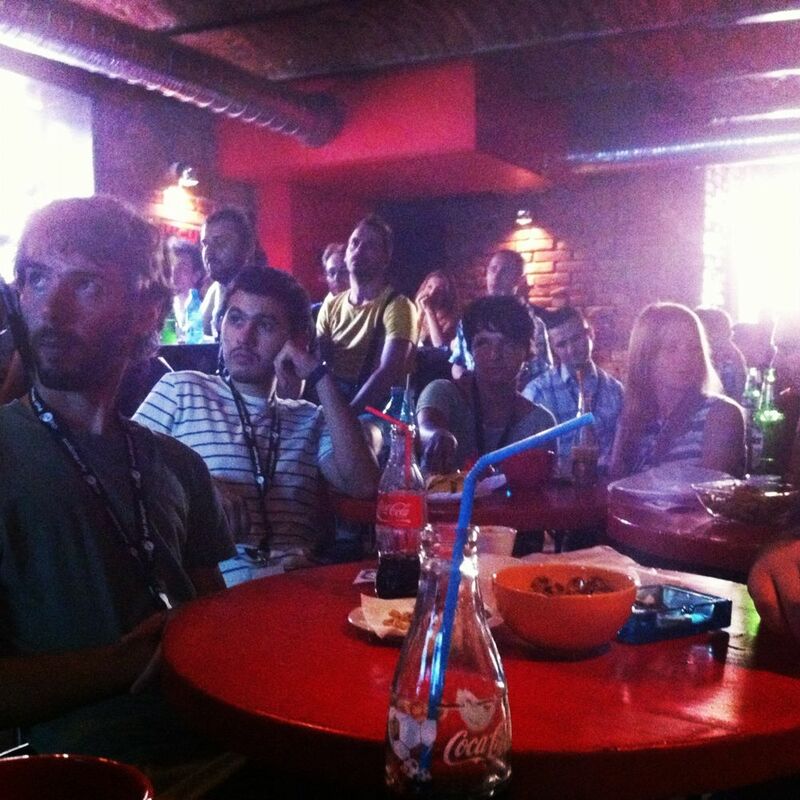 A number of the audience were female, and Evozon employ female developers which is again a better indicator of the health of their community, and diversity gives a better feel to the event. The talks by the other speakers were interesting and it would have been nice if I could have had a less 'beer focused' chance to talk to them presenters after the event. Unfortunately because I was speaking last I was way behind everyone on the hop-consumption scale, so our conversations were a little bit out of sync and I wasn't able to talk to them as much as I would like about their talks. 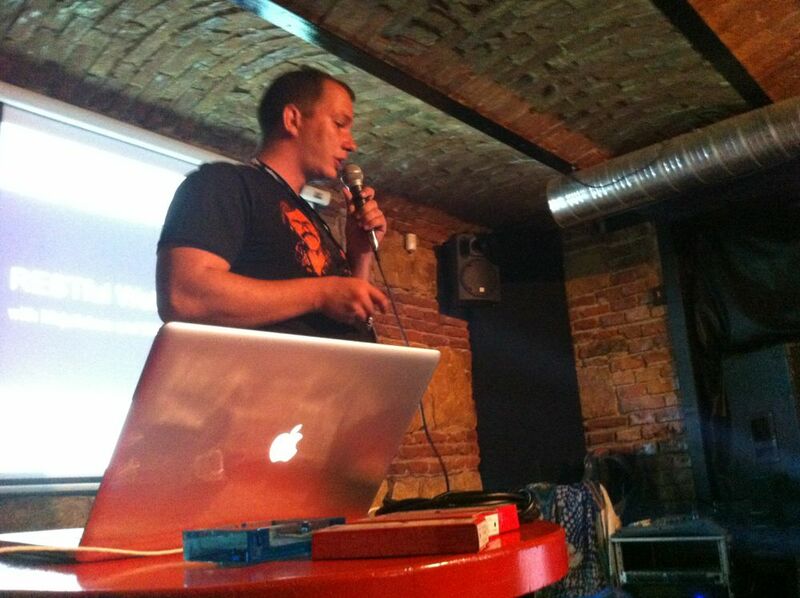 Dumitru gave a good overview of Perl::Critic, its functionality and configuration, and how to implement it. Tudor Constantin gave the first run of his RESTful Webservices so he could practice delivery before taking it to YAPC::EU. 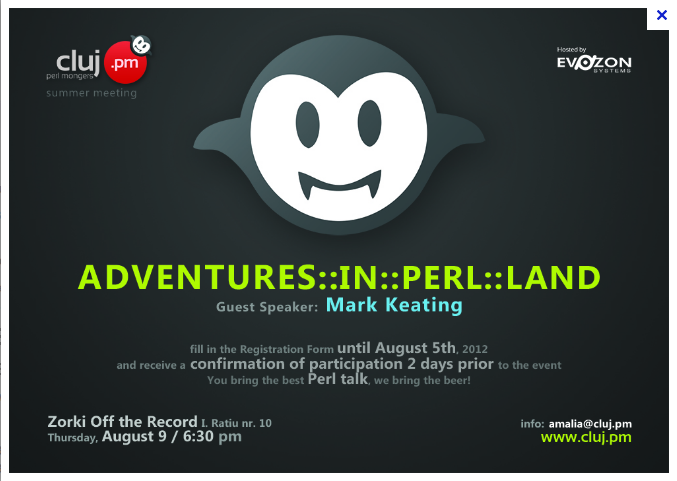 Tudor Marghidanu gave us a very personal appreciation of Perl and the need for us to all 'go home and read a book ;)'. 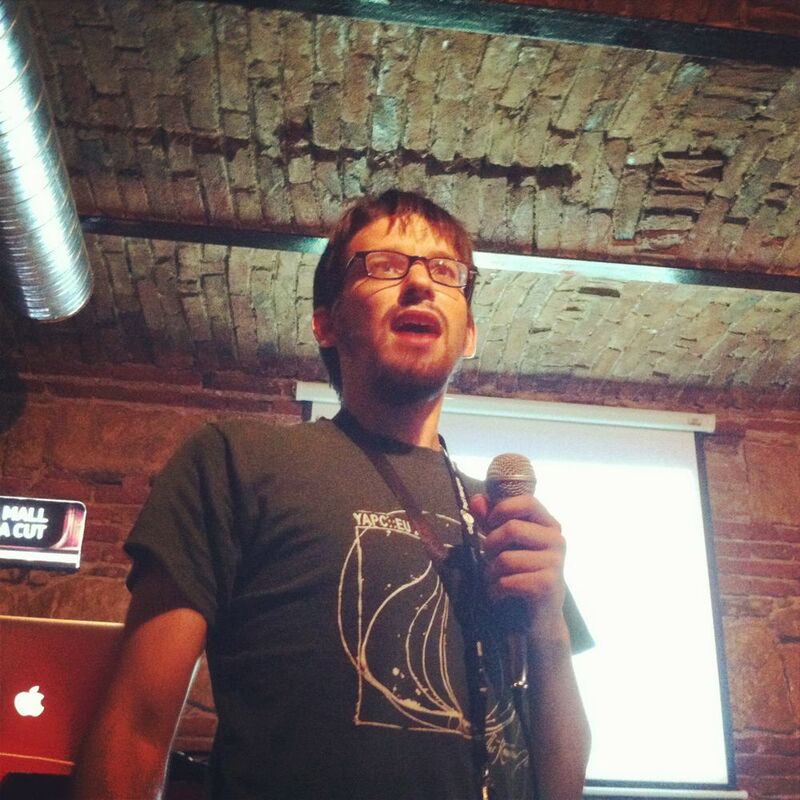 Attila gave a Layman's view to Perl, that was in fact a good list of features, things to promote and pitfalls to avoid when first using Perl. Leon gave a great starter talk of how to contribute to Perl that needs work to stretch to 20 minutes or some editing to bring it down to five minutes. All of the talks were good and I want to thank my fellow presenters for also talking that evening (and to Amalia again for organising the run of the events). As for my talks, these were well received. 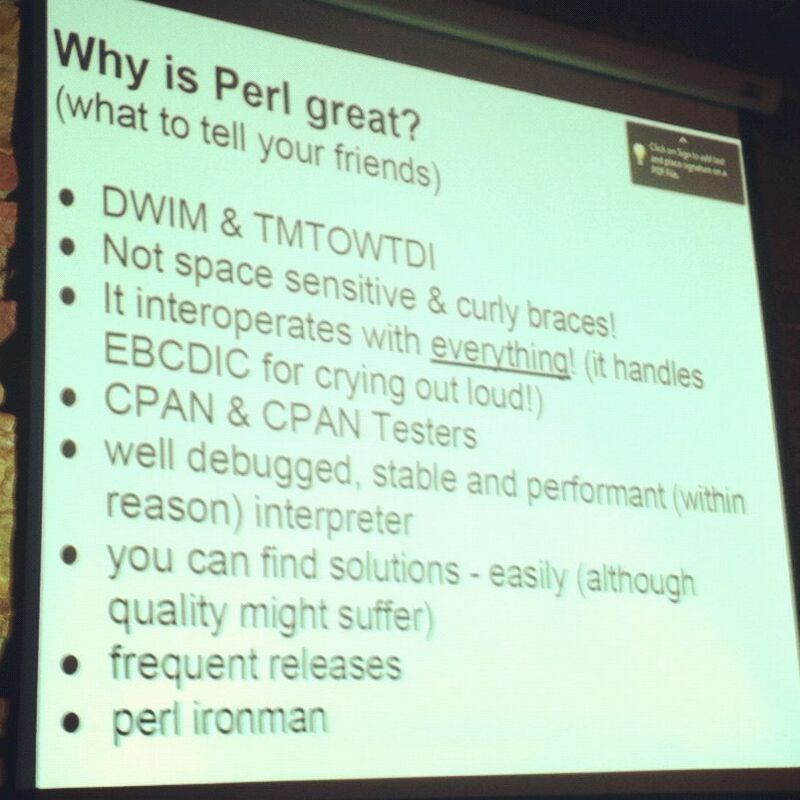 There was a number of non- or less-technical members in the room so the Perl and CPAN poem inspired by Dr Seuss got a good reception and a lot of positive feedback. The other two talks were a little more intense for some people, thankfully the talk on The Family Perl had a non-technical bias so was better understood. It was interesting to see how much better my talks and presentations were based on the practice of the material and the good vibe from the crowd and organisers. 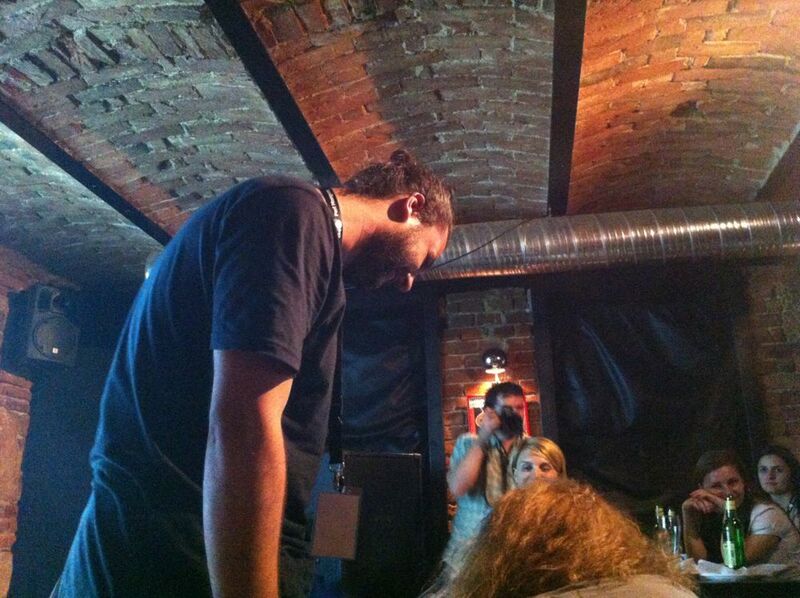 It made the whole act of presenting very relaxed. 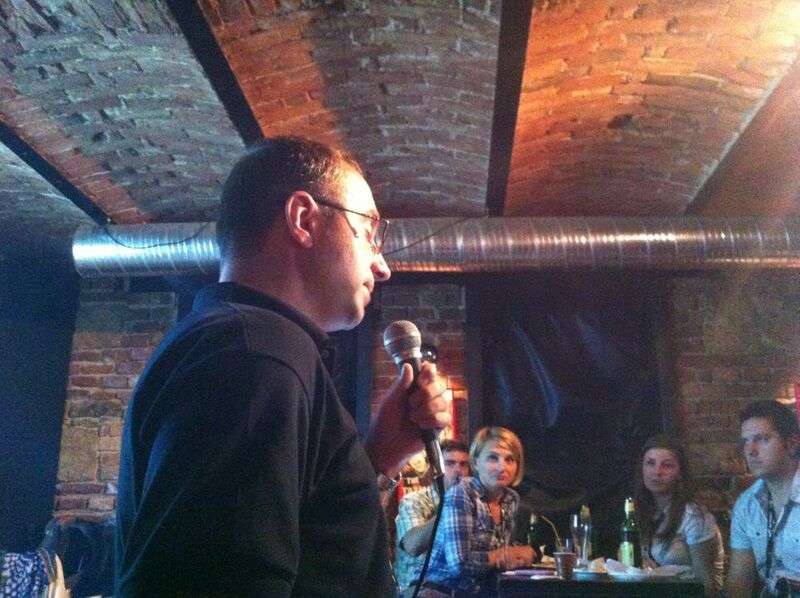 My nerves before the event were quickly quelled by a warm reception from the audience. The evening ended with Beer, and probably more beer, all provided by the wonderful bosses of Evozon, I know everyone had a cheery-beery time. It was very hard saying goodbye to Cluj after such a short visit. 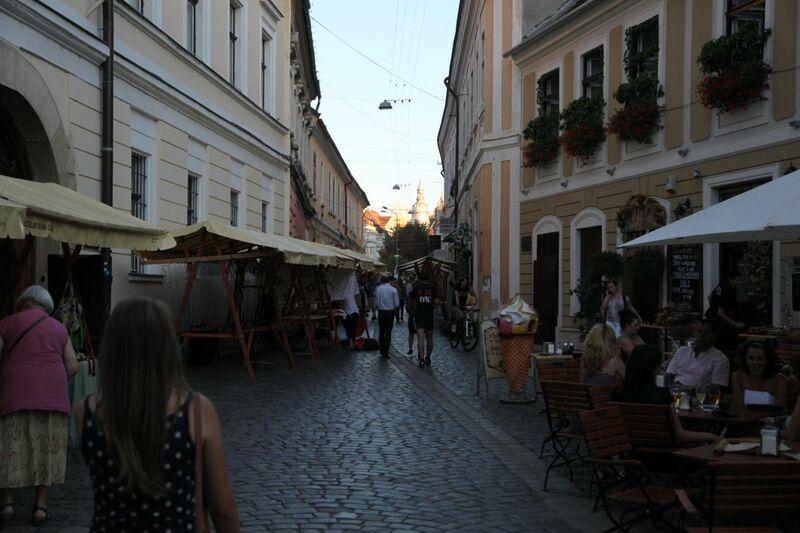 I really would have loved to have the chance to stay another couple of days and walk around the city a little more. 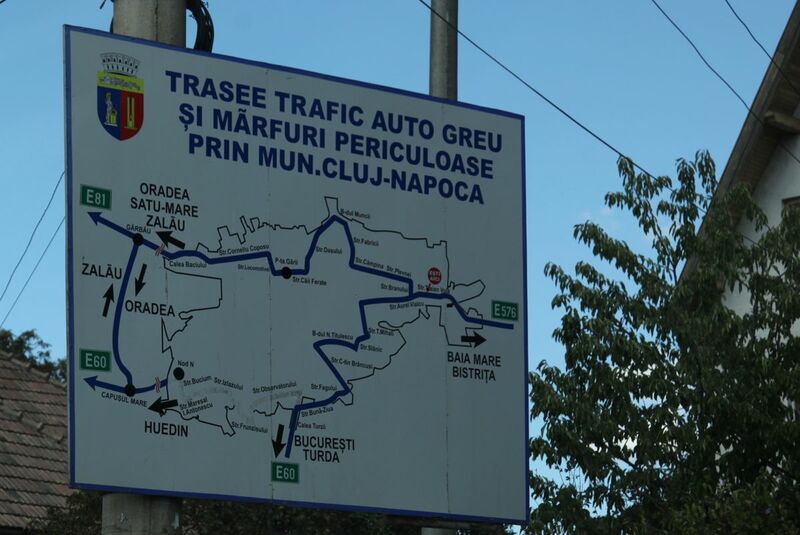 My friendly, ex-Romanian-FBI , driver took me on a little side trek on the way back to the airport. 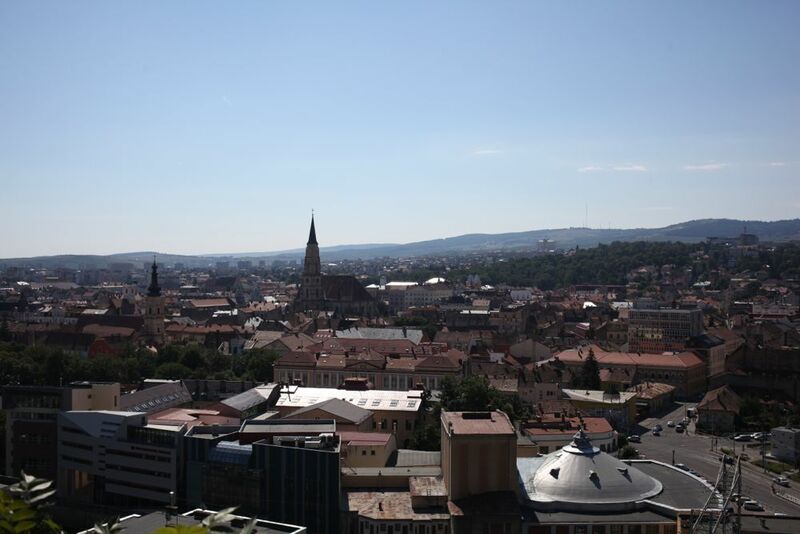 We ascended a local hill that had a hotel atop it but also had great views overlooking Cluj. I was able to see the city in full and take photographs. This was a really nice touch as he had seen me take pictures on the way into Cluj  and wanted to be helpful. Though this sunshine itself is more curse than blessing as the heatwave that has gripped the country this summer will affect late season crops and the government has had to set aside funds for compensating small farmers. It is a standard for most of Europe to have good coffee available in workplaces, we like to do the same at Shadowcat but they still excel at this abroad. His words, not an attempt by me to mock him. I always take photos on the drive/trip in from an airport to an event, ever since my first presentation, it helps me to make a localised slide, an artefact and a homage to the location.